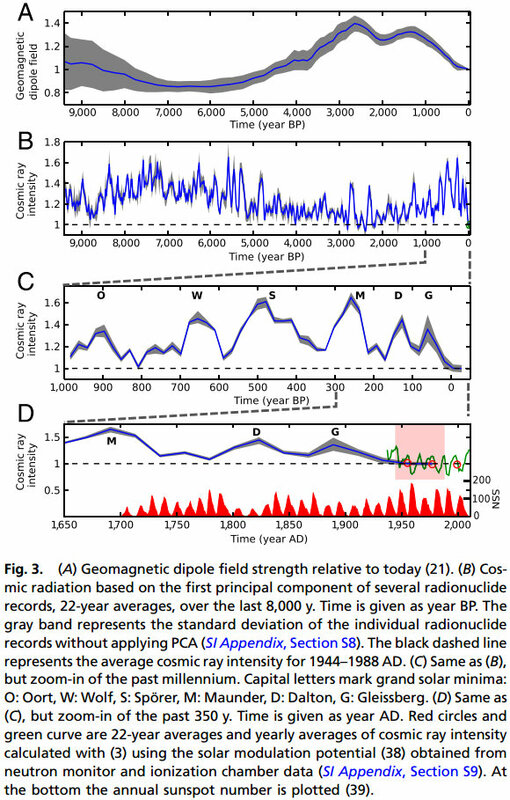 A 2012 paper published in the Proceedings of the National Academy of Sciences reconstructs solar activity from isotopes in ice cores and tree rings, and finds solar activity at the end of the 20th century was at the highest levels of the past 9,000 years. 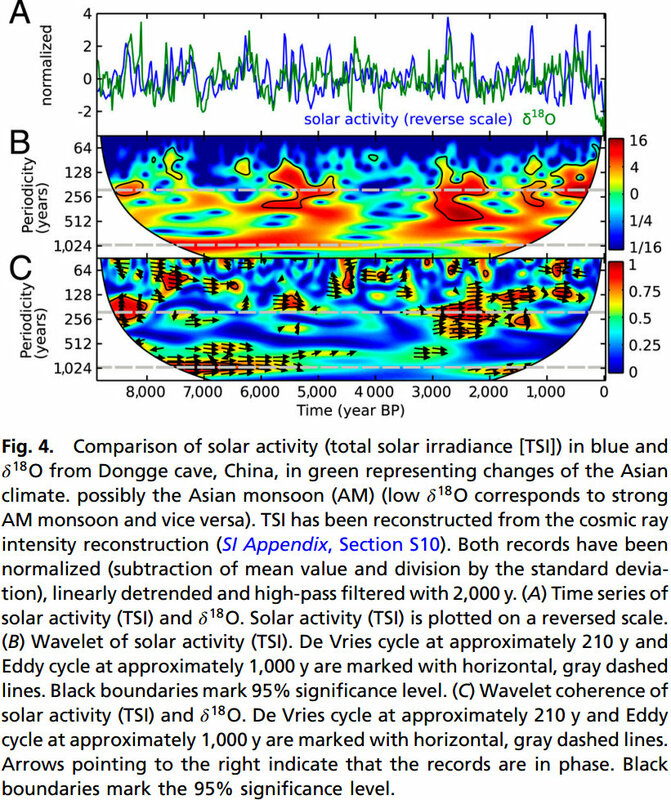 The paper confirms other peer-reviewed publications indicating that the Sun was particularly active during the 20th century in comparison to the past several millenia In addition, the authors find good agreement between solar activity and the Asian climate as determined from stalagmites in the Dongge cave, China. Blowup and flipped 1st graph from Fig. 4 below shows the year 2000 at the right side of the graph, 9000 years ago at the left side. Added red line shows solar activity in blue at the end of the record was at the highest levels of the past 9000 years. Note graph has been reversed vertically since the graph below in Fig. 4 is on a reverse scale. Cosmic ray intensity is inversely related to solar activity. High solar activity is indicated by low cosmic ray intensity, as shown by graphs B, C, and D at different timescales. Understanding the temporal variation of cosmic radiation and solar activity during the Holocene is essential for studies of the solar-terrestrial relationship. Cosmic-ray produced radionuclides, such as 10Be and 14C which are stored in polar ice cores and tree rings, offer the unique opportunity to reconstruct the history of cosmic radiation and solar activity over many millennia. Although records from different archives basically agree, they also show some deviations during certain periods. So far most reconstructions were based on only one single radionuclide record, which makes detection and correction of these deviations impossible. Here we combine different 10Be ice core records from Greenland and Antarctica with the global 14C tree ring record using principal component analysis. This approach is only possible due to a new high-resolution 10Be record from Dronning Maud Land obtained within the European Project for Ice Coring in Antarctica in Antarctica. The new cosmic radiation record enables us to derive total solar irradiance, which is then used as a proxy of solar activity to identify the solar imprint in an Asian climate record. 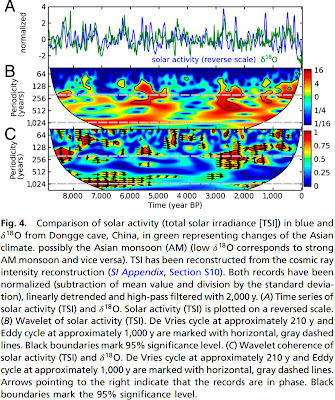 Though generally the agreement between solar forcing and Asian climate is good, there are also periods without any coherence, pointing to other forcings like volcanoes and greenhouse gases and their corresponding feedbacks. The newly derived records have the potential to improve our understanding of the solar dynamics and to quantify the solar influence on climate.